Let us assume, please, that we all agree Jane Austen is a genius and reading her books is an experience equivalent to eating chocolate bon-bons and sipping champagne (or Scotch, if you’re of my inclination) while the sun sets on a perfect late-spring day as a string quartet plays Bach on your mansion’s terrace. Thus I will spare you discussion of why I love Jane Austen, which is pretty much why everyone else loves Jane Austen, and move on to the particular pleasures of Persuasion, her last completed novel. Persuasion concerns Anne Elliot, a woman in her late twenties who once had an understanding with a young naval officer, an understanding that was given up under the well-meaning influence of a family friend, Lady Russell. In the intervening years Anne has not married and Captain Wentworth has made a name and fortune for himself; thanks to Anne’s father’s profligacy, the two meet again when Frederick’s sister and brother-in-law rent the Elliott estate. However, Frederick has not forgiven her for what he feels was a grievous error on her part, and as other romantic interests present themselves, it seems as if the two will never reconcile. 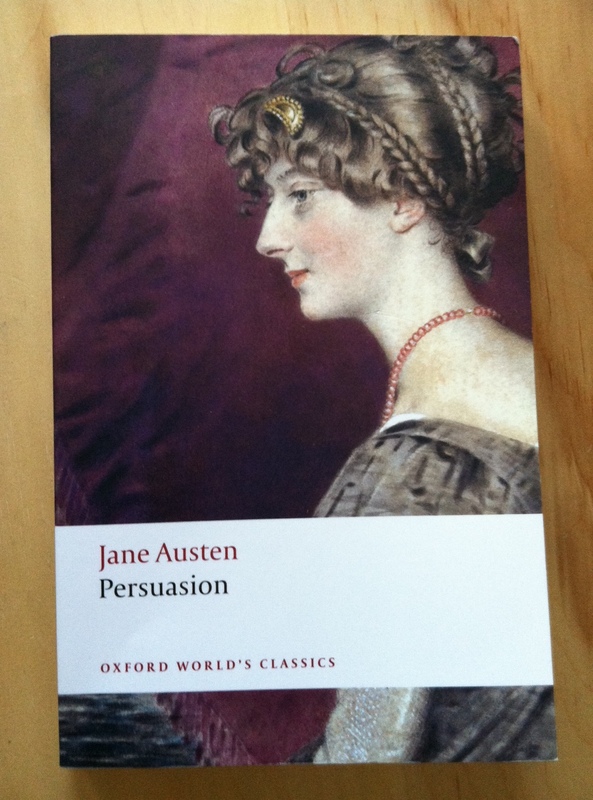 Persuasion is my favorite of Austen’s novels, and I limit myself to a reading every three years or so. What struck me on this reading — perhaps because I was reading To the Lighthouse at the same time — was the immense interiority of the novel — so much of the writing focuses on Anne’s emotions and reasoning. Akin more to Elinor Dashwood than Elizabeth Bennet or Emma Woodhouse, Anne feels deeply but does not permit herself to give vent to those feelings. What distinguishes her from Fanny Price (I’ve never much cared for Fanny) is her sense of duty, her inward nature turned outward to comfort and help those around her, however undeserving they may be. In other words, Fanny comes across as a victim, acted upon by others, while Anne is fully-realized rational agent. Perhaps her age has something to do with her maturity and kindness (she is selfless, but not a martyr); she’s roughly ten years older than Austen’s other heroines. In addition to Anne’s charms as a heroine, Persuasion also offers delightful bits and pieces of advice and food for thought. Here are a few of my favorites. By the way, my favorite film adaptation of Persuasion is the 1995 film version with Amanda Root and Ciarán Hinds. It is, I think, the truest film adaptation of Austen I’ve ever seen. What’s your favorite Austen novel? Have you read Persuasion? What did you think? Emma has always been my favorite, but I haven’t read Persuasion, so maybe it’s about time. 🙂 I love all the quotes you pulled! Oh, I hope you’ll read it! It’s wonderful. Emma is so interesting — and amazing as a successful failure! It wasn’t till a class that I learned she’d set out to write a heroine nobody would like — and ended up with Emma. Except I love her, so I’m not sure what that says about me haha! Persuasion is my favorite, too, both the novel and the adaptation you picked! So good! And Ciaran Hinds — wowza. It’s been such a long time for me since I read Persuasion that I can barely remember it. I enjoyed being reminded, and especially liked the passages you included. For me, they are the best way to remember how a book made me feel. Love this post, Carolyn. Gorgeously evocative of why Austen is such a force to love being consumed by….My favorite is still Pride and Prejudice, but how can I not love them all. Persuasion has been too long off the night table and your quotes and impressions of Anne make me think its time to set it there again, especially as I may find help with the point of view issues I am struggling with in my novel. I appreciate you were reading Woolf alongside Austen — she is also on my list of tutors for p.o.v. P&P is so great — and I admit that I’d prefer to be Lizzy Bennet than Anne Elliot, for all Anne’s goodness. POV is tough for me too, especially in trying to distinguish characters’ voices from my own. I’ll need to reacquaint myself with Anne…it may be that now I’m older I’ll see and relate to her much differently. Did you see Becoming Jane? Its a bit light, but I loved it. I haven’t seen it, but I think it’s on Netflix — maybe next time I’m folding laundry I’ll pop it on. Persuasion is one of the Jane Austen books I still haven’t read (including P&P, if you can believe it!). Reading your post makes me want to read it sooner rather than later. Yay! It’s so wonderful. Also very short compared to the others. P&P is a treat — so very funny. Happy reading! I need to revisit Jane Austen. I remember liking Emma best, and then not enjoying P&P…I am pretty sure I read Persuasion…but all of this was many years ago and I may have a different perspective now. Great post – you’ve convinced me! Hurrah! I hope you’ll like it! that’s my review about it !